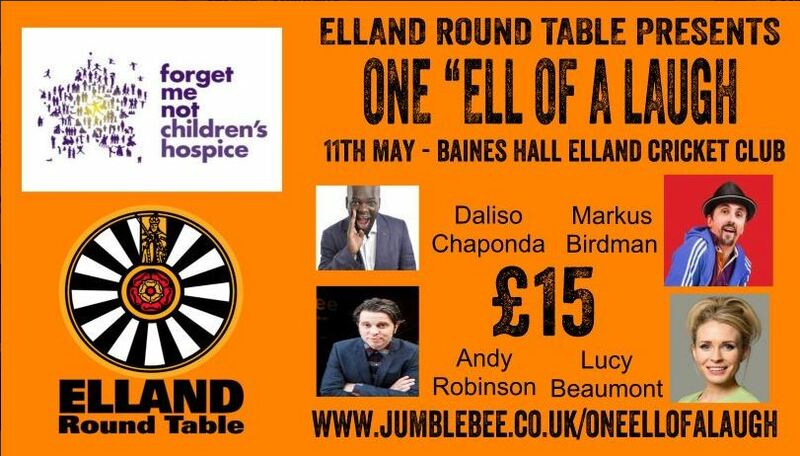 Hosted by Elland Round Table there will be an evening of stand up comedy on Saturday 14 April, 7:00pm-11:15pm at Elland Cricket Club, Hullenedge Road. Justin Moorhouse is a Manchester born and bred comedian, presenter and actor. He’s taken several comedy shows to the Edinburgh Fringe, toured the UK with his stand up, been nominated for his theatre acting, appeared in films and won Celebrity Mastermind. In February 2015 Justin performed to over 200 000 people in a 15 night stage version of Channel 4’s Phoenix Nights. The critically acclaimed show at the Manchester Arena raised £5 million for Comic Relief. Lost Voice Guy – Lee Ridley AKA Lost Voice Guy can’t talk but isn’t silent. He is (probably) the first stand up comedian to use a communication aid. The MC for the Evening will be talented Roger Monkhouse. Please note. Strong language and adult themes throughout. £15 including booking fee. tickets on sale now. You can purchase tickets online at Billetto. 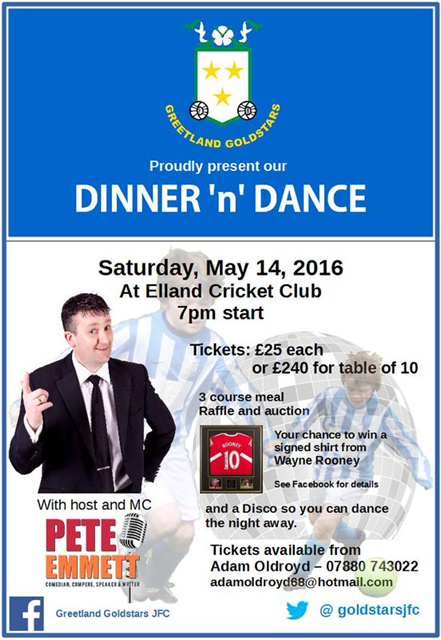 This entry was posted in Apr, Elland, Events and tagged Elland Cricket Club, Elland Round Table. 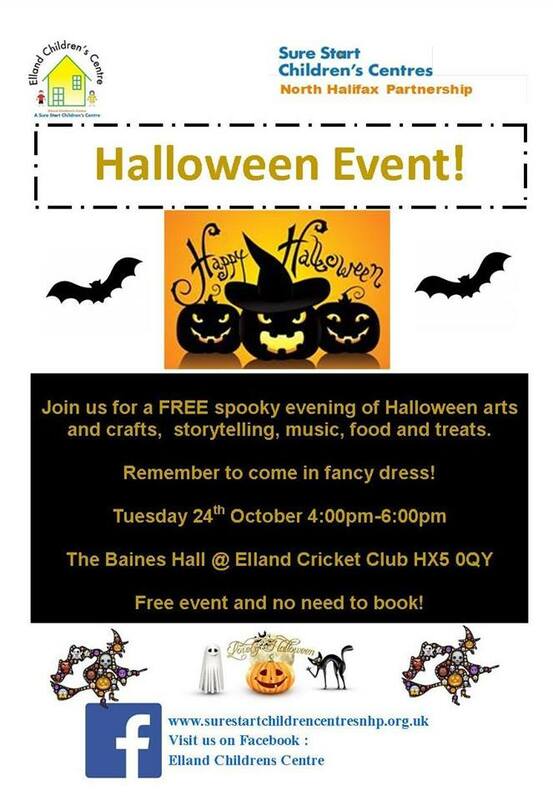 On Tuesday 24 October at 4pm-6pm enjoy a FREE spooky evening of Halloween arts and crafts, storytelling, music, food and treats. Remember to come in fancy dress! Free event and no need to book! For more information call 01422 266197. This entry was posted in Elland, Events, Oct, Sure Start and tagged Elland Cricket Club, NHP Sure Start Children’s Centre. Do you know someone who’s on their own this Christmas? 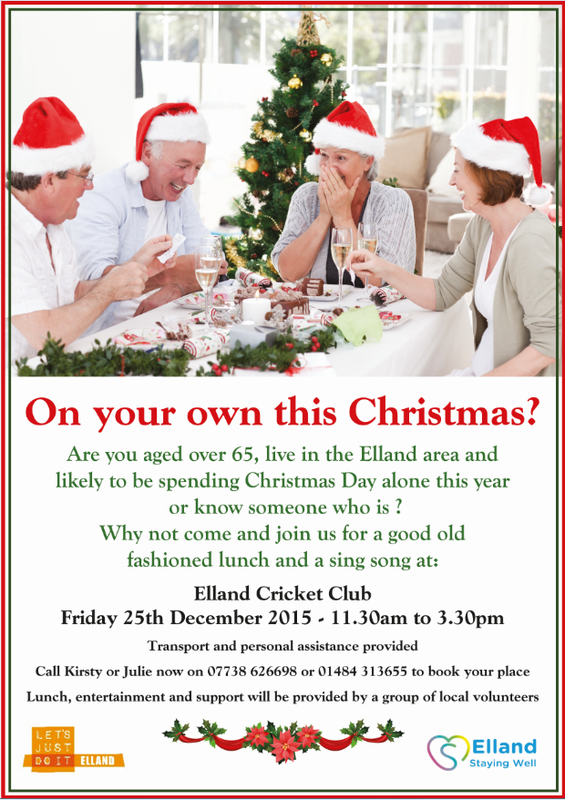 If you know someone over 65 in the Elland area who is likely to be spending Christmas alone, why not let them know about the Christmas Day lunch at Elland Cricket Club, organised by the Elland Staying Well team? The event will run from 11.30am to 3.30pm and lunch, entertainment and support will be provided by volunteers. There is no cost, but a voluntary contribution of £5 can be paid on the day. Limited places available, contact Kirsty or Julie on 01484 313655 or 07738 626698. This entry was posted in Dec, Elland, Get Involved / Have Your Say and tagged Christmas, Elland Cricket Club, Elland Staying Well. Are you aged over 65, living in the Elland area and likely to be spending Christmas Day alone this year or know someone who is?… Why not go along and join in for a good old fashioned lunch and a sing along. Transport and personal assistance provided and lunch, entertainment and support will be provided by a group of local volunteers. This entry was posted in Dec, Elland, Get Involved / Have Your Say and tagged Christmas, December, Elland, Elland Cricket Club, Events, Get Involved, Older People, Staying Well. Vintage Fair at Elland Cricket Club – This weekend! Enjoy yourself at a vintage fair this weekend including over 20 vintage stalls, a classic motor show (including cars, bikes, buses, lorries and military vehicles), fairground rides, refreshments and even an RAF fly-past. This entry was posted in Elland, Get Involved / Have Your Say, Sep and tagged Elland Cricket Club, Elland Vintage Weekend, Events, Get Involved, September. Enjoy FREE entry for a cream tea and entertainment from a live Jive Band in an afternoon of nostalgia and 1950’s prices for refreshments. Entry is by ticket only – Contact Ingrid Holdsworth on 01422 256919 to get yours. Vintage Ball at Elland Cricket Club – This Friday! Enjoy a Vintage Ball, with live music from 60’s legends The Bachelors, 3 course Black tie dinner, charity raffle and auction. This entry was posted in Elland, Sep and tagged Elland, Elland Cricket Club, Elland Vintage Weekend, Events, Get Involved, Live Music, September.